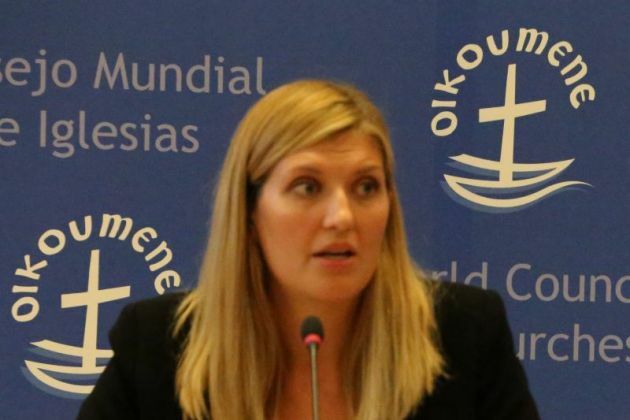 (Photo:© Peter Kenny / Ecumenical News)Beatrice Fihn, executive director of the International Campaign to Abolish Nuclear Weapons addresses a press conference at the World Council of Churches on Dec. 6, 2017 after ICAN was named the 2017 Nobel Peace Prize winner. The 2017 Nobel Peace Laureate, the International Campaign to Abolish Nuclear Weapons has strongly criticized the decision of U.S. President Donald Trump to withhold certification of the Joint Comprehensive Plan of Action regarding nuclear weapons in Iran. "President Trump's attempt to disrupt the Iran deal, despite the fact that the IAEA has repeatedly certified that Iran is complying with its terms, is a jarring reminder of the immense nuclear danger now facing the world and the urgent need for all states to prohibit and eliminate these weapons" " said Beatrice Fihn, executive director of ICAN after the Trump decision. The president on Oct. 13 said he would not recertify that Iran was in compliance with the accord known as the P5 1 agreement. It was negotiated by the U.N. Security Council's five permanent members - China, France, Russia, the United Kingdom and the U.S. - plus Germany which had joined together in 2006 in diplomatic efforts with Iran regarding its nuclear program. ICAN is a global coalition and it counts among its major international partners, faith-based organizations such as the World Council of Churches, Pax Christi International and the Buddhist-group Sokka Gokkai International. Only a week before Trump's action on the U.N.-baked Iran agreement on Iran, ICAN was awarded the 2017 Nobel Peace Prize. It is a global campaign coalition working to mobilize people in all countries to inspire, persuade and pressure their governments to prohibit nuclear weapons. "The JCPOA is a demonstration of how well diplomacy can work, and like the Treaty on the Prohibition of Nuclear Weapons, it reflects the urgent global imperative to eliminate nuclear weapons and the grave threat they pose" said Fihn. She said President Trump's rejection of the JCPOA is an incitement to proliferation, makes achieving further agreements to rein in the nuclear threat more difficult, and increases global risk of nuclear use. In times of great global tension, with increasing threats of nuclear war, the U.S. President is igniting new conflict rather than working to reduce the risk of nuclear war, ICAN said. "If ever there were a moment for nations to declare their unequivocal opposition to nuclear weapons, that moment is now," said Fihn. "There is an urgent need to strengthen existing and develop new norms against the use and possession of nuclear weapons by joining the Treaty on the Prohibition of Nuclear Weapons" added Fihn. In the United States, more than 750 Catholics called on Trump and the U.S. Congress to seek diplomatic solutions to defuse rising tensions between their country and North Korea and to assure that the U.S. remains a party to the Iran nuclear deal. Crux reported that leaders of dozens of religious congregations, officials at Catholic organizations and individual parishioners said they were concerned by the president's recent threats to "totally destroy" North Korea and to withdraw the U.S. from the Iran accord because both actions would bring the world "to the brink of nuclear catastrophe." "Responsible, moral leadership would recognize the Iran deal as an important example of successful diplomacy and conflict transformation that engaged many nations in an arduous, nonviolent process to build trust and avoid military confrontation," the letter said. "Similar honest and respectful, if difficult, diplomatic engagement should mark our approach to North Korea," the letter said. The U.S. Congress has 60 days to act on whether to restore economic sanctions, take other actions against Iran or do nothing.